Anything can be cuter with a cat on it. This includes mugs, clothes, and now, thanks to a new organization called Tags for Hope, driver’s licenses. At 20 bucks a pop, Tags for Hope allows you to create a custom I.D. tag for your pet that looks like a miniature driver’s license. You can even choose the state, and the final product is quite convincing. The best part? No trip to the DMV necessary. The tags, which fit on a regular collar, include information that could be important in case your pet is lost. On one side, owners can fill out the pet’s name, address, and contact number, and on the other side, there is space to provide dietary restrictions, medical conditions, and microchip number. All of these factoids can decrease the time between “lost” and “found,” and in the meantime, the Good Samaritan who takes your Fluffy in will understand to not feed the pup processed beef if he’s on a paleo diet. As if cute ‘lil I.D. tags weren’t fun enough, the money they generate goes toward helping animals in need. 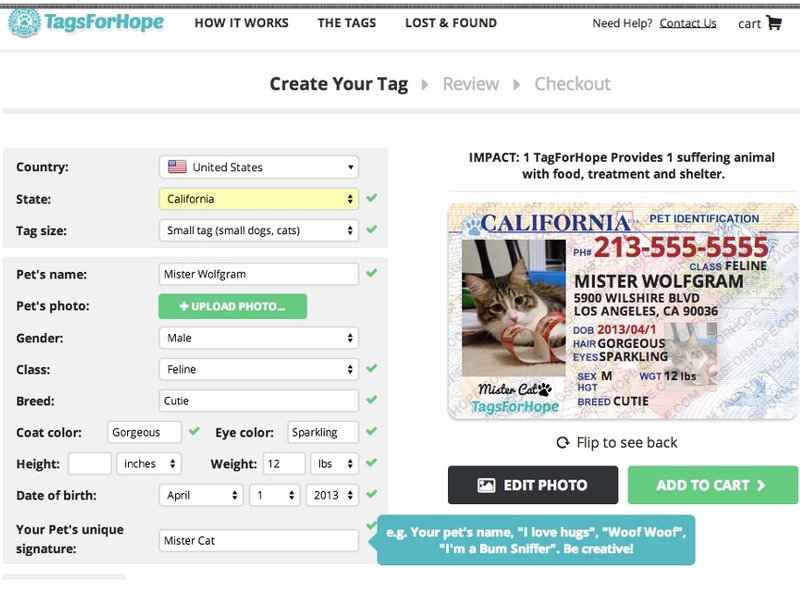 Tags for Hope works with animal shelters around the world to provide treatment for pets waiting to be adopted. The organization recently raised over $2,000 with SPCA St. John’s for homeless animals in their care. As Tags for Hope grows, it plans on expanding its line of pet safety products and teaming up with some of the hundreds of shelters and pet rescue organizations that have reached out to work with them. Good cause, adorable tags, and zero hours in driving school? Sounds good to us. Check out tagsforhope.com for more information and to design a custom driver’s license for your baby.